We are experts in helping people find a mortgage who have defaulted on loan or credit card repayments in the past. Our extensive experience in this area means we know which lenders to approach. Whatever your credit history, simply complete our quick no obligation enquiry form and we'll get back to you with what your options are. With the massive growth in credit cards and personal loans in recent years, it is not surprising that more and more people find themselves with a 'black mark' against their name. People who have defaulted on previous credit agreements will struggle to get a mortgage with a high street lender as their defaults will show when the lender undertakes a check of their credit file and this will adversely affect their credit score. A default will be listed on your credit file for six years. People miss repayments and default for a number of reasons. This may be because of a simple oversight such as forgetting to inform the company of a change of address, or it may be a result of redundancy or divorce or borrowing more than they could afford. Fortunately a few specialist lenders offer mortgages to people with defaults, and some high street lenders have recently relaxed their lending policies slightly. It all depends on the severity of your problems, a minor mishap a few years ago should not forever banish you from taking out a mortgage but a recent history littered with defaults will almost certainly mean little or no choice. As always, the bigger the deposit the wider the choice of lenders. Whatever your circumstances, simply complete our quick no obligation enquiry form and we'll let you know whether we can help. Stephen Whittaker is a 37 year old IT consultant from Woking in Surrey. In March 2015 he and his wife Martha had decided to buy a bigger property as they were expecting their second child. They were living in a two bedroom flat which they had purchased in 2007 and they had a mortgage with a leading high street bank. They found a three bedroom end of terrace property with a small garden which suited them perfectly. Stephen approached his bank for a mortgage and assumed it would be a formality particularly as they were existing customers and had not missed a single mortgage repayment. However, Stephen and his wife Martha were dismayed when the bank informed them they would not be able to help because a default was listed on Stephen's credit report for a missed credit card payment in 2012. At the time the default occurred, Stephen was in hospital for an operation and the missed payment was a simple oversight. Unfortunately this single blunder prevented them from getting a mortgage from their bank. Both Stephen and his wife Martha were determined not to give up on the property and came across us after a search online. We were happy to advise them of niche lenders who should be able to help and an application for a mortgage with a specialist lender was made through us and accepted in May 2015. In August 2015 Stephen and Martha moved into their new home with their son Charlie. In September 2015 Martha gave birth to their daughter Jessica and they are all now happily settled into their three bedroom property thanks to our assistance and the help of lender who didn't base their assessment of their credibility as a borrower on a single default. Mobile phone companies such as 02, EE, Three and Vodafone are notorious for issuing defaults for relatively small amounts, typically £10 to £100 and quite often the first time a person is aware a default is on their credit report is after they've applied for a mortgage. Shaun and Teresa Hales had agreed to purchase a £275,000 three bedroom semi detached property in Formby, Liverpool. Both were in full time employment, Shaun is a civil engineer and Teresa a primary school teacher and neither had experienced issues getting credit in the past. The approached a high street bank and were horrified when their application was turned down because of being too high a risk. On investigation a default for £20.45 was listed on Teresa's credit file by a mobile phone company and this was enough for the lender to get cold feet. Teresa had closed the account some months previous and believed the account was settled in full but it appears a small amount was outstanding and this lead to the default being issued. Teresa was left feeling really frustrated as had she been aware of the debt she would have paid immediately particularly as it was such as trivial amount. It's an all too often occurrence that people experience difficulty getting a mortgage due to a default on their credit report they were previously unaware of. In the case of mobile phone defaults, many comment they never received notification via a letter or phone call. The mobile phone companies often say their procedure is to send text message reminders, but that if the customer has changed providers they may never receive it. Fortunately for Shaun and Teresa, we were able to find a lender who overlooked the rather minor default. Both were in good jobs and could comfortably afford the mortgage repayments. 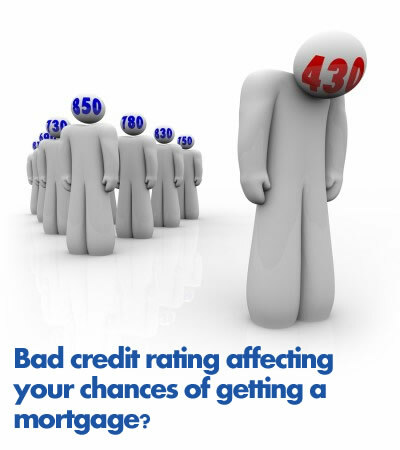 Who are adverse credit mortgages suitable for? Do only specialist lenders offer adverse credit? Are there any downsides to adverse credit mortgages? Will it help me improve my credit rating? Home | Contact Us | Privacy | Disclosure | Resources Your home may be repossessed if you do not keep up repayments on your mortgage.